These coral colonies live in somewhat deeper water, (ten feet) but their brilliant blue color makes them easy to notice. 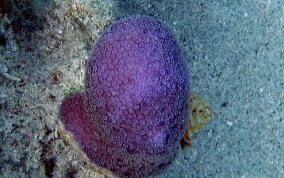 (don't get confused with the purple lobed sponge). 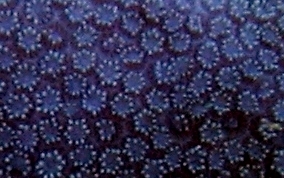 If you can get close enough that you can see the coral polyps are in the form of a polygon, (5 sides). 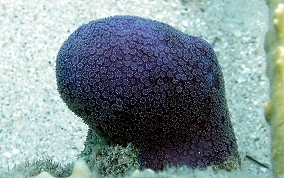 They encrust the area they have colonized, either on areas of dead coral or on rocky substrates. I have only noticed the rich blue, almost purple colonies, but the may also be a lighter lavender or lilac color. They are not common. These colonies are small, only 2-6 inched on diameter or knobs that are about an inch in diameter.